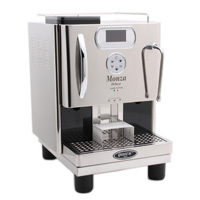 A deluxe super automatic espresso machine suited for both commercial and home use, this Quick Mill Monza model has a lot of convenient programming options, all highlighted on the bright LED display. While the coffee-making process is taken care of for you, you still have control over a host of factors, including the temperature, brewing time, and cleaning cycles. The stylish machine even lets you add decaf pre-ground coffee if you so desire. This behemoth machine, costing $2,595, takes up a lot of space, but you can choose to use the tank or hook it up directly to your water supply.